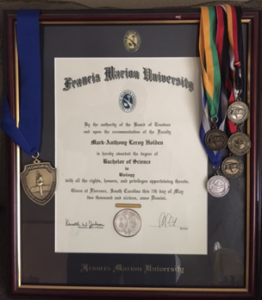 Mark Anthony Holden, BS Degree with Honors – Biology Adjunct Faculty, Tutor at Florence Darlington Technical College & ER Scribe at McLeod Hospital in Florence, SC. assistant. 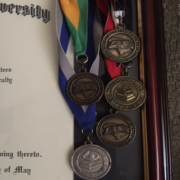 He is now applying to medical school, and he proudly displays every Summer Reading medal he has ever earned right next to his Bachelors’ Degree! Mark-Anthony is just one person who has been positively influenced by the library – imagine how many others are just like Mark-Anthony! Smalls proudly displays his Summer Reading Metals on his framed college degree. 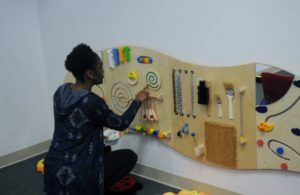 Tamiesha Jackson, an early intervention specialist at Berkeley Citizens, looks through sensory games at the library’s Young Learner’s Toolbox. The photo was taken by Rickey Dennis, Berkeley Ind. early intervention professionals to the library to spread the word about a new learning epicenter called the Young Learner’s Toolbox. 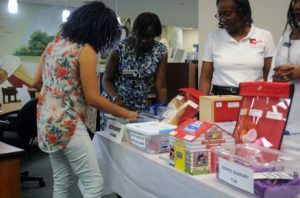 About two years ago, the library received a grant to create a place where children with learning, language or communication barriers can obtain out-of-school, hands-on learning experience. 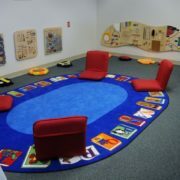 The center features stacks of multi-sensory toys, learning kits and IPads. It also has open space for young children to play freely with the novelties. 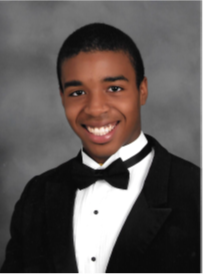 “I have been thinking of how I can make a difference in the life of a child with autism,” Lewis-Coker said. Elizabeth Harvey with ABC Therapies said the program could voice a larger message. Typically, Harvey said, parents are leery about bringing special needs children to public places like church or the library where they are supposed to be quiet. “Those families become isolated. They don’t know where they’re welcome because the behaviors [are] very unpredictable,” Harvey said. The Learner’s Toolbox could be a place where ‘everyone is welcome’ and children can express themselves freely. “[The library] wants to meet everybody’s unique learning needs,” Harvey said. According to Lewis-Coker, Berkeley County Library System is the only county in the state with such a program and could serve as a prototype for other counties. Brittney Reynolds with Berkeley Citizens examines playful objects at the YLT. This photo was taken by Rickey Dennis from the Berkeley Ind. Content from the local newspaper, Berkeley Independent. At the Berkeley County Library System (BCLS), we believe in enriching the lives of the people in our surrounding community. 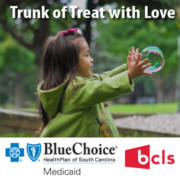 BlueChoice® HealthPlan of South Carolina has a similar mission: to provide affordable health care options to South Carolinians. In the end, both organizations arrive at a related purpose: improving the lives of our customers and meeting their needs with specialized services. 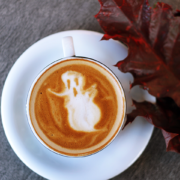 That’s why we’re excited to partner with BlueChoice® HealthPlan for a family event, “Trunk or Treat with Love”, on Saturday, October 21st, from 4-6 pm. BlueChoice® HealthPlan knows how to combine fun and education. Visitors to the event will receive free giveaways, healthy snacks, and health screenings. Literature in both English and Spanish will be available. Kids and adults can enjoy the Interactive Activity Zone, featuring an activity table and oversize games. And don’t forget the face painting, bead making, and storytelling! 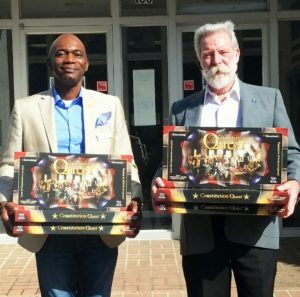 Berkeley County Library Director Gene Brunson with Mr. James Retz, Library Board Member who generously donated The Constitution Quest game for every library branch. During the summer of 1787, in a stuffy hall in Philadelphia, fifty-five men wrote, argued, discussed, and compiled the Constitution of the United States of America. On September 17th, 1787, thirty-nine delegates signed the document. One of these signers was Charleston’s own Charles Pinckney, one of the founding fathers. But why does a document from over two-hundred years ago matter to us today? It’s more important than knowing the answer to a Jeopardy question. The Constitution defines the powers of each branch of the federal government – executive, judicial, and legislative. By designing a system of checks and balances for each, the founding fathers established a balance of power between the government and its citizens. By learning about the Constitution, Americans can know the laws that keep their personal freedoms in place. While you’re there, browse the stacks for resources for all ages about the founding of our country. If you’re on the go or can’t make into a branch, check out our great e-resources! Wherever you are, your library is available to help you make the most of Constitution Day 2017. Eclipse Preparation and Information – We Got It! 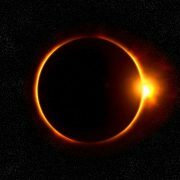 https://berkeleylibrarysc.org/wp-content/uploads/2017/02/solar-eclipse-1482921_1280.jpg 720 1280 berklib https://berkeleylibrarysc.org/wp-content/uploads/2013/04/logo-large2b.png berklib2017-08-01 15:34:492017-08-09 14:33:02Eclipse Preparation and Information - We Got It! Struggling to get your little one more engaged with reading? What could be more fun than digital flip books? If you have not already, then you need to try out Tumble Book Library, now with even more amazing features! We are excited about this enhanced version of Tumblebooks and the changes to the access structure that it will bring. The access structure change will be particularly helpful for teachers and families who homeschool. The enhanced version of Tumbebooks is considered the premium version which includes: over 1,100 titles; resources for K-6; lesson plans for teachers; animated talking picture books; chapter books; National Geographic videos; both fiction and non-fiction materials; graphic novels; books in English, French, and Spanish; and many other resources. – Plus it is FREE with your BCLS Library Card. 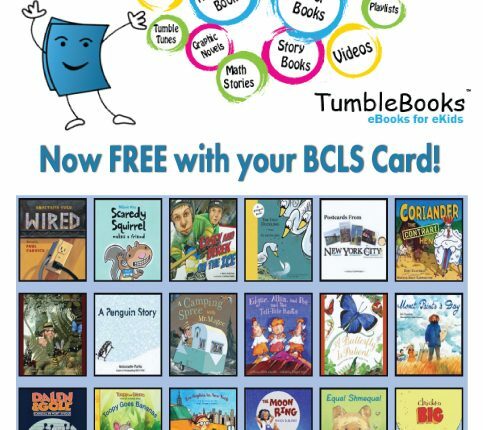 (Click here to get a free 30 day card to test it yourself if you are not a current BCLS library card holder). Use it for independent reading, group activities, story time, lessons, and more! And, as a digital library of animated talking picture books, it has the added bonus of being accessible – 24/7 – from any device with an internet connection. library of books at their fingertips, anytime they want. Best of all, because the collection is digital, there is an unlimited number of copies of each title. Books are never checked-out, never on hold, never damaged, and NEVER have apple juice spilled on them! At Home: Exchange after-school cartoons with after-school TumbleBooks! Quiet time before bed! You can even use TumbleBooks on road trips! TumbleBooks is a great way to enhance family literacy and at-home reading. LEARNING NEW THINGS: TumbleBooks diverse collection connects to curriculum topics and supports what children are learning in class. In addition, they have the freedom of choice and can select titles on subjects that interest them. There are MANY regular nonfiction titles about science, geography, mathematics, history, and more. (Premium subscribers have a large selection of Math stories too!) In addition, there are lots of non-fiction-inspired story books, as well as books which teach valuable life lessons. Students can find new interests or stoke the fire of current interests by browsing our site. TumbleBooks’ Story Books can be a great and accessible way to introduce new ideas and information. ESL STUDENTS: With the large list of Spanish, French, and bilingual TumbleBooks, the site can be used in ESL and second-language classes for story time, independent study, and for Comprehensive language learning. SPECIAL NEEDS: TumbleBooks’ open nature lets children of all levels, interests, and abilities read and interact with titles at any level. The titles are accessible and enjoyable for special needs children and they help facilitate their class participation alongside the rest of the class. MATH, HISTORY, SOCIAL STUDIES, AND GEOGRAPHY LESSONS: Just as with Social Studies, Reading, and Language Arts classes, TumbleBooks’ extensive and varied nonfiction sections can be utilized in classes you might not normally associate with picture books! TumbleBooks’ picture books are both entertaining AND educational, and they help teach children new and complex concepts that might be difficult to grasp in regular nonfiction books. ONE-ON-ONE TUTORING: TumbleBooks is not only great for classroom story time, but it’s also an invaluable tool for one-on-one teaching. Our teachers have told us how they’ll sit with a child and read a book together… pausing to discuss vocabulary words and concepts along the way. Not only that, but they’ve also used it for Buddy Reading where a younger student is paired with an older classmate. 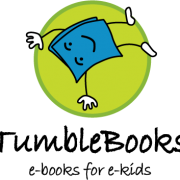 ENCOURAGING RELUCTANT READERS: TumbleBooks’ format attracts readers of all abilities and interests. Teachers have told us how students with little interest in picking up a physical book will spend hours reading TumbleBooks for FUN as well as for class time! SPEECH THERAPY: TumbleBooks story books are professionally narrated, and when combined with highlighted text for kids to follow along, they’re a great tool for speech therapists to use while helping children. 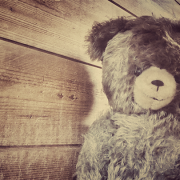 The books let children hear a variety of voices, styles, pronunciations, and emotions through the narration – which serve as a great supplement to the therapist’s instruction. PLAYLISTS: Our collection features over 100 pre-made playlists from which you can choose! Each Playlist includes 2 or more TumbleBooks: some are themed playlists, some are for certain reading levels, and some are just for fun! Are you in the mood for stories about animals? Is it the first day of school? Do your kids need some imagination inspiration? We have you covered! 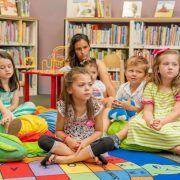 PUZZLES AND GAMES: TumbleBookLibrary’s Puzzles and Games section provides entertaining and educational activities based on your kids’ favorite TumbleBooks. There are puzzles, memory games, crosswords, match-the-sentence games, and more! COMMON CORE PORTAL: TumbleBooks exclusive Common Core Portal helps educators find specific lesson plans and TumbleBooks to help fulfill core level requirements. Simply click on the Common Core link in the blue navigation bar to access the feature anytime! The Common Core portal offers tabs for Reading: Literature, Reading: Informational, Texts, and Mathematics. Within each section, we list the levels for kindergarten through grade five. TUMBLESEARCH: The top right corner of the site has a link to our TumbleSearch feature. TumbleSearch allows you to find JUST the right book for you: by subject, length, and reading levels! remember where to find it? Just enter the title and it’ll pop right up! STORY BOOK OF THE DAY: Visit TumbleBookLibrary every day to see a new highlighted Story Book of the Day! 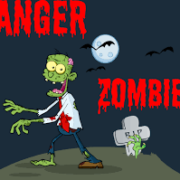 We also highlight Graphic Novels, Non Fiction, Read Alongs, and Videos of the day! When you log in to TumbleBookLibrary, the Story Book of the Day slider is at the forefront of the home page, and it rotates between the other book categories every few seconds. Inspiration can come from many places, and we hope that our Book of the Day feature may help you find your new favorite read! Help you revisit an old favorite! Most of all, we hope it will help you explore everything the site has to offer. FAVORITES AND PLAYLISTS: Have you found a book you LOVE and want to come back to it again later? Add it to Favorites by clicking on the “Add to Favorites” button beneath the book cover. It’s that time of year again. Your child is entering kindergarten for the first time in just a month. In Berkeley County, we want your child to be reading-ready. This summer you can sign up your child for a free subscription to FancyAnts, a reading literacy program adaptable to your student’s needs. This opportunity, available from now until August 27th, is free to any Berkeley County School District student attending kindergarten during the 2017-18 school year. How is this possible? A partnership between your Berkeley County School District and Achieve3000. SmartyAnts, a product from Achieve3000, is an engaging and exceptional way of learning. The software assesses the reading-readiness level of the student and offers an adaptable program perfect for his or her needs. The result? “Through engaging instruction and games, students develop essential literacy skills like phonemic awareness, phonics, fluency, vocabulary and comprehension strategies,” according to Achieve3000’s website. Parents and families can use the platform as a support tool as well. SmartyAnts offers a Teacher Dashboard, which lets you monitor the student’s level, growth, and time spent – and offers extra resources for additional learning. All you need this year is a working device and internet access and your future student can be reading-ready. To sign up for your free subscription, call 877-235-2525 and use code SmartyBCSD or visit achieve3000.com/SmartyBCSD.